I’m in full Autumn color mode this year! NO neutrals on my porch allowed! 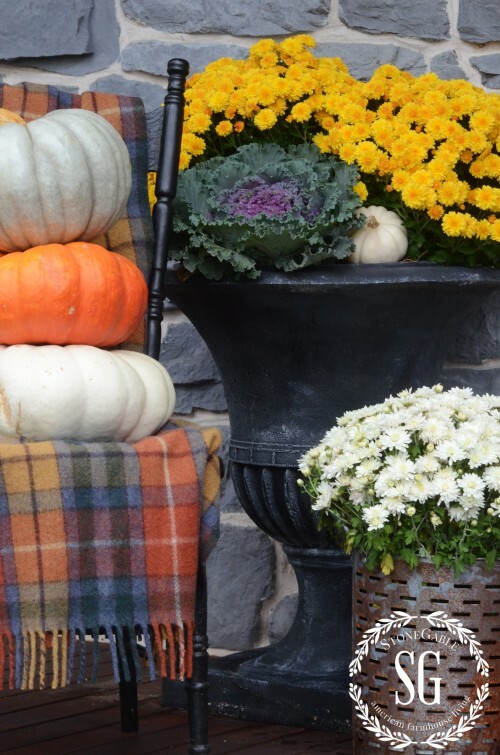 I’m decorating with saturated color… a profusion of mums and lots of colorful leaves! 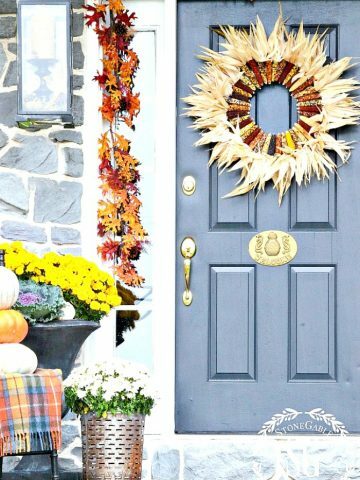 My front door is welcoming fall and anyone who comes by! When I did this photo shoot it was pouring!!! Pouring buckets! Torrents of rain!!!! 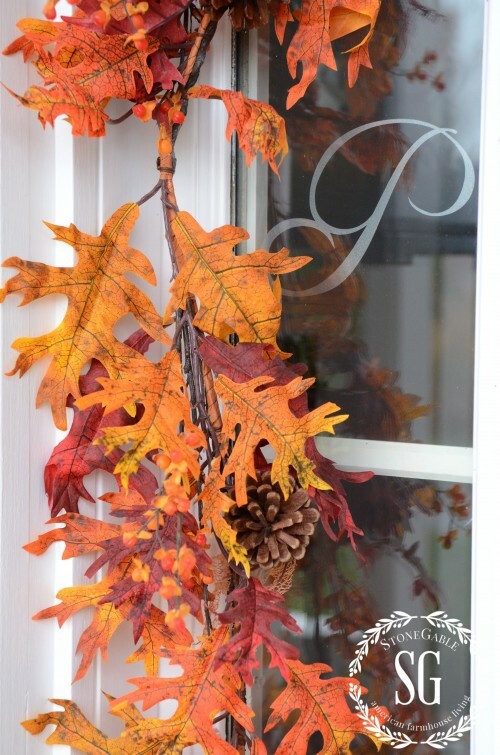 But I think it just made the fall colors deeper and brighter… and that is just how I wanted my porch to look! 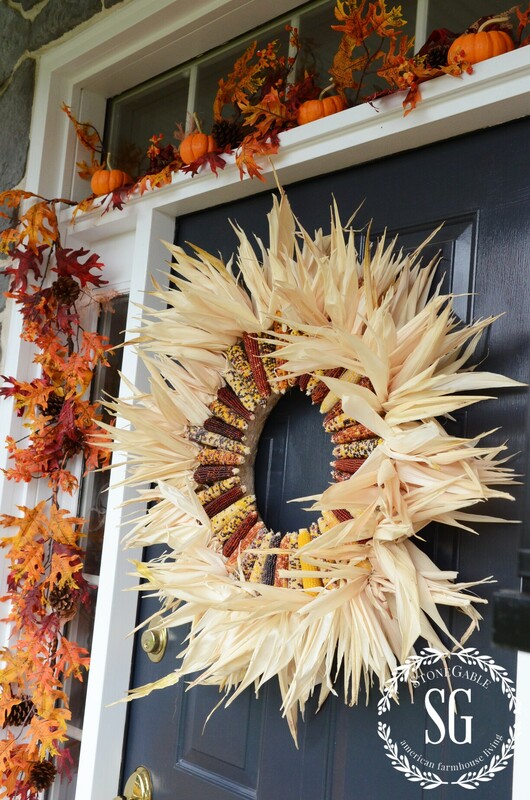 An Indian Corn Wreath makes such a big statement on the front door! You can make this wreath too! Click HERE for the tutorial! It’s having a bad hair day… just like me! The rain puffed up the husks! 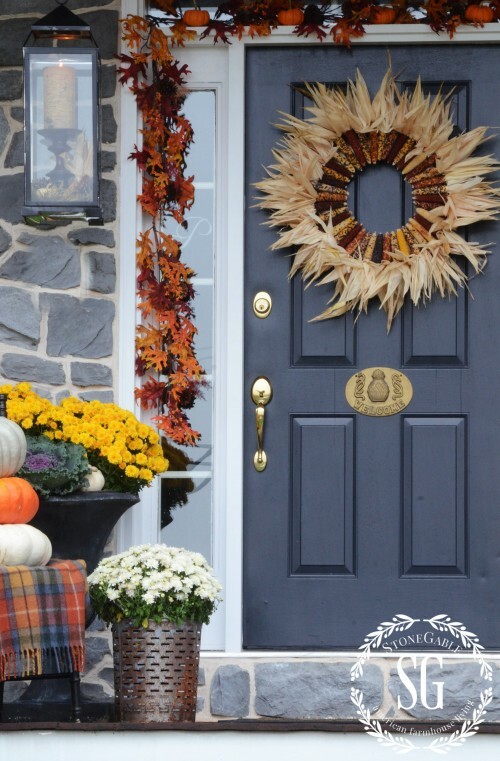 A leafy garland frames the door and little pumpkins sit in the ledge of the transom! 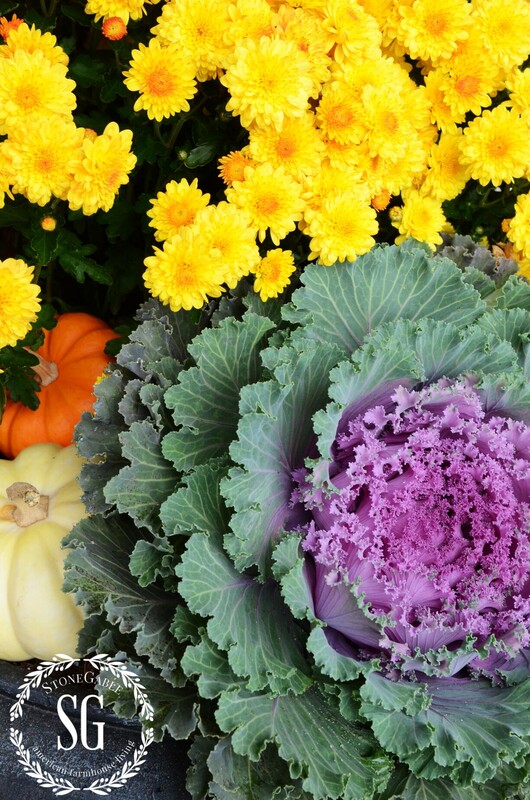 I filled the porch urns and galvanized buckets with mums, flowering cabbage and pumpkins! This little chair was my grandmothers. I painted it a chippy black and moved my pumpkin totem to the chair. One of the best things we (and when I say “we” I mean Bobby) did this fall was to put hooks in the ceiling of the porch so we can hang these lanterns! I have lit candles in them now, but I’ll replace them with battery operated ones on a timer. I love the little glow they give off at night! Fall, my very favorite season, will be here and gone in no time! I’m going to enjoy every single second of it! If you haven’t entered the StoneGable~ Elliot-Heath Designs Giveaway click HERE! One lucky StoneGable reader will get this gorgeous fall pillow! You know, it’s really not too early to begin thinking about the Holidays and getting inspired! 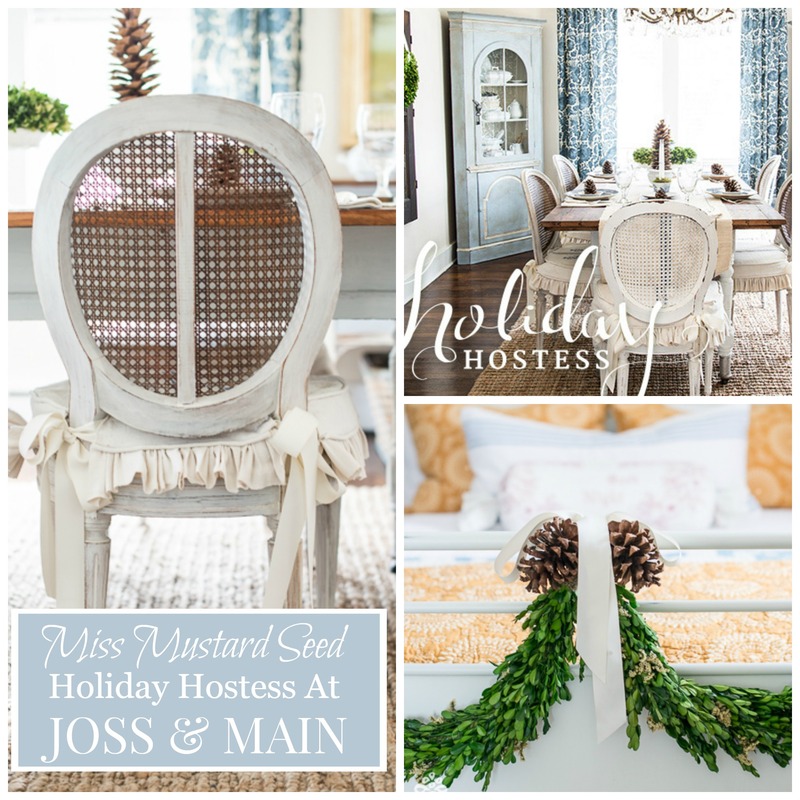 Miss Mustard Seed is the first of Joss & Main’s Holiday Hostesses! Click HERE see all the GORGEOUS Miss Mustard Seed images and the FABULOUS Joss & Main Finds! In a couple of week’s I’ll be sharing my holiday home at Joss & Main and so will Courtney from French Country Cottage and Laura from Finding Home! 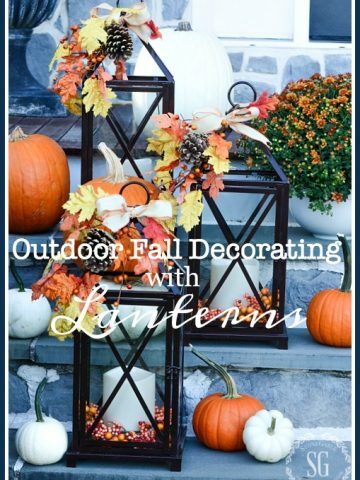 You might want to pin this to your Pinterest FALL or PORCH boards. You can follow me HERE and see what I’m pinning! I always love your posts & have been following you forever! 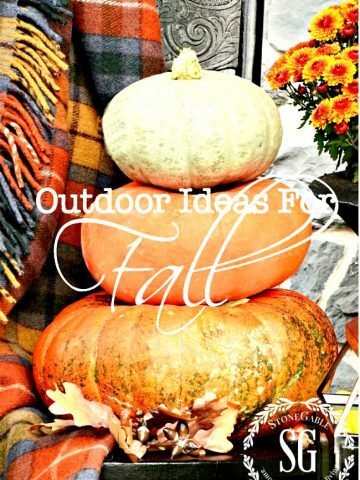 Fall is my favorite time too & will be using your suggestions immediately! Beautiful as always! Thanks so much for your truely inspiring posts! That was very hard because I loved them all. 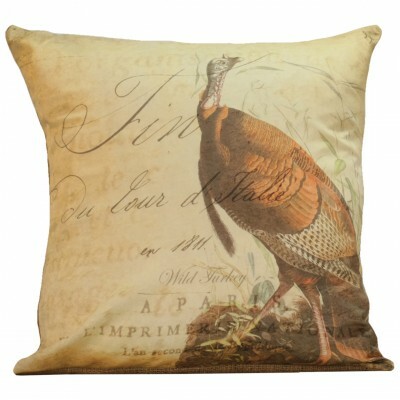 If I were in more of a Christmas kind of mood I’m sure I would have picked a Christmas pillow. 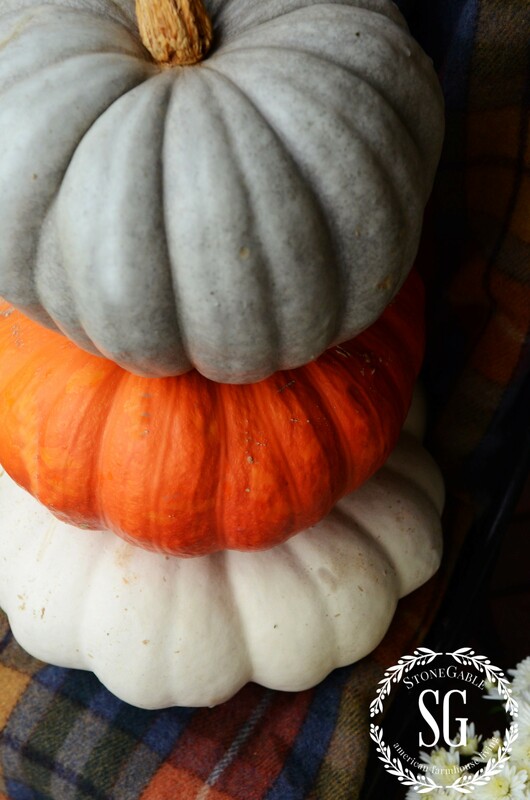 But Fall comes first so I pick the HA-53 pumpkin seed pillow. Beautiful… you have me day dreaming for Fall right now!! 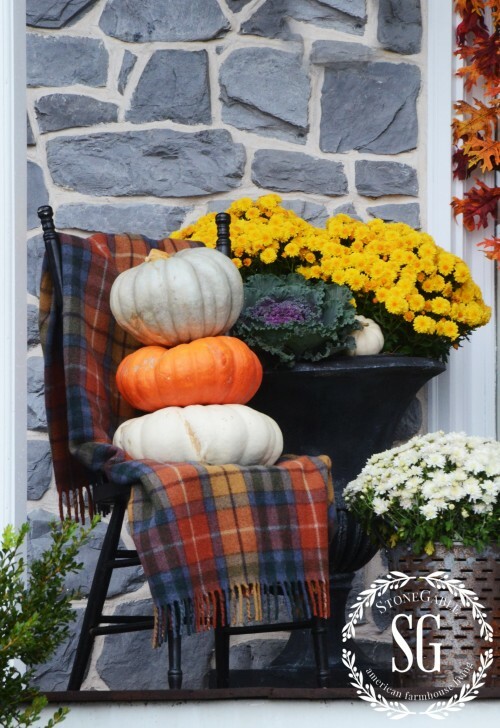 Love your front porch – so very warm and inviting! So there is your Stone Gable! Very handsome, indeed. 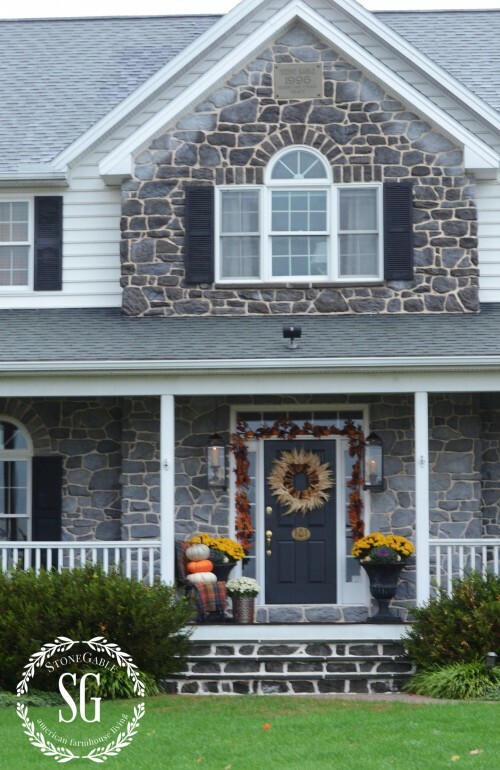 And a pretty porch too! Love the lanterns! Love,Love,Love as usual, I too have some lanterns and I never thought of putting my pillar candles on candlesticks, they needed some height and I did use some candle stick candles, which seem to be brighter than the pillar candles, but thanks for the great idea! I love your porch, it is so warm and inviting! Hi Anne. Our paint color was an accident. We got it at Lowes… Valspar. It was supposed to be Graphite Gray, but it must have gotten mixed wrong. We love the color but we have no idea what it is! Yvonne, The post on the easiest Christmas decorating will not come up — can you help? I love Fall and Christmas too (food, decor and everything!!!) – follow you all along but am anxious to see the easy Christmas post!! Love it all!! Thanks for the inspiration! I might have said this to you in the past – but the photo of your porch with the lovely tartan blanket really warms my heart. That happens to be my family tartan. This is the Buchanan antique blend. So pretty – it makes me want to go abroad and roam the hills of Ireland. 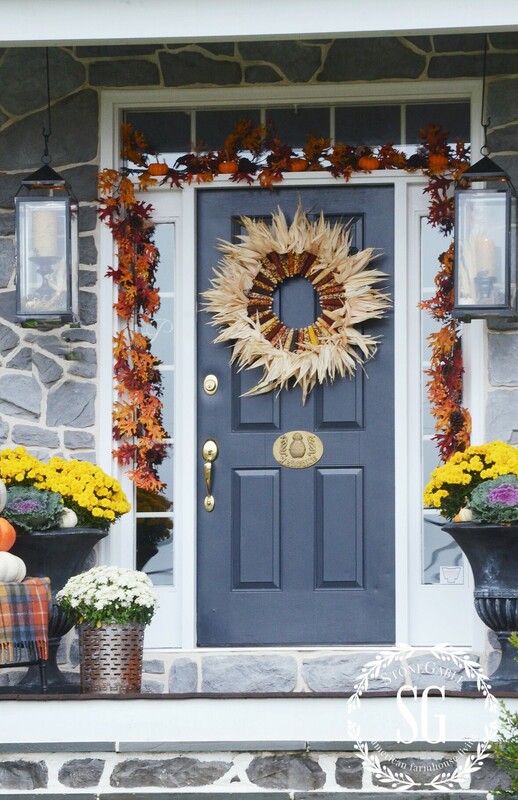 you have a beautiful porch, so nicely decorated for a gorgeous season! thank you for the opportunity to enter the fabulous pillow drawing! Your porch is lovely! It’s purring here as well, but it looks like a very bright light bulb is shining through it all.The foliage is really showing off this year! Gorgeous! Yvonne, have you done a post showing us how to make the apron dish rack? Yvonne I would love to be walking up to your front porch to join you for a cup of tea or a glass of wine. Your home is so welcoming! Love it! 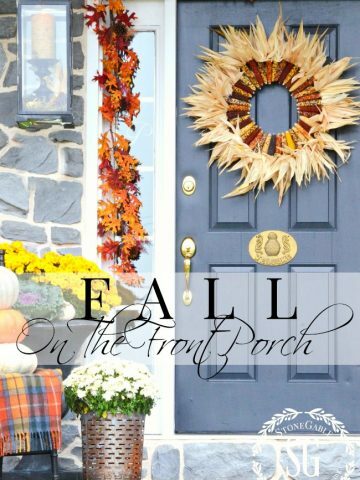 I love fall and you captured it perfectly on your porch! 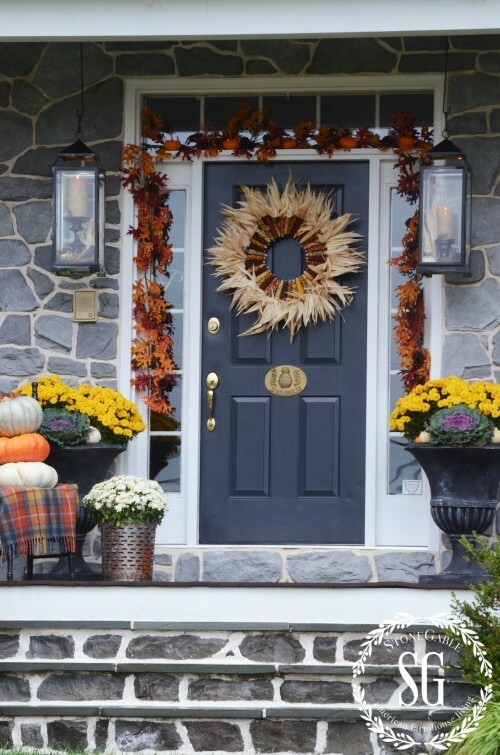 Love love love that wreath Yvonne…the whole porch looks FALLTASTIC!! Gorgeous and I love the lanterns. I have been anticipating this since yesterday’s post. 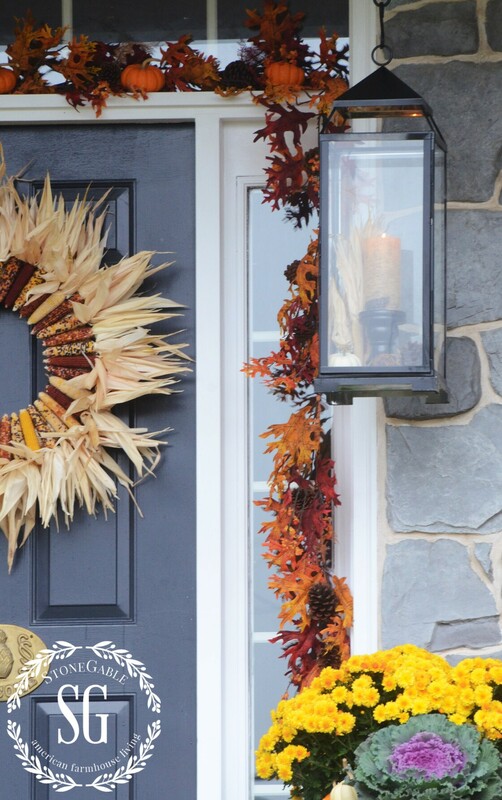 I would love to know where you purchased your leaf garland. This is so much more realistic than other ones. Have a blessed day! Hi Barbara! I got the leaf garland at A.C. Moore. It was 60% off! It all looks fantastic Yvonne, and I love the new blog layout.